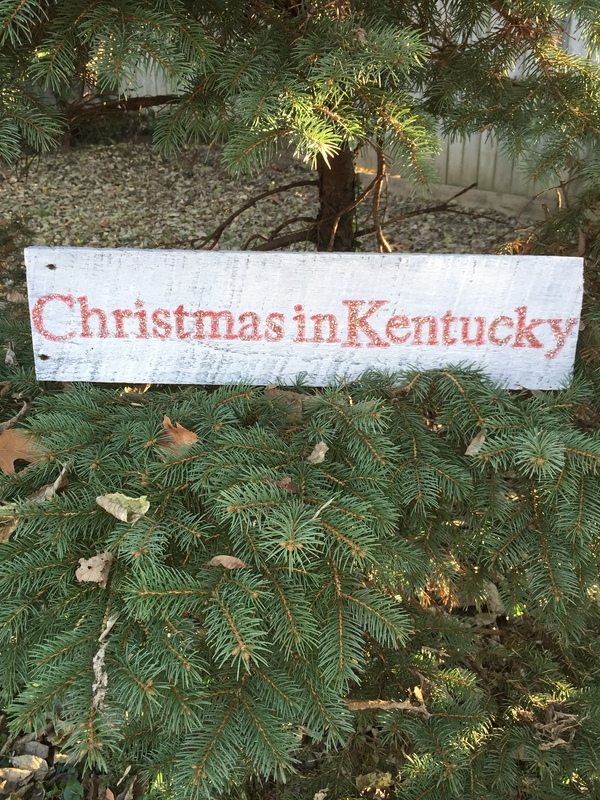 Since I am not a brick and mortar shop I thought I would have a little Christmas Open House on the blog. 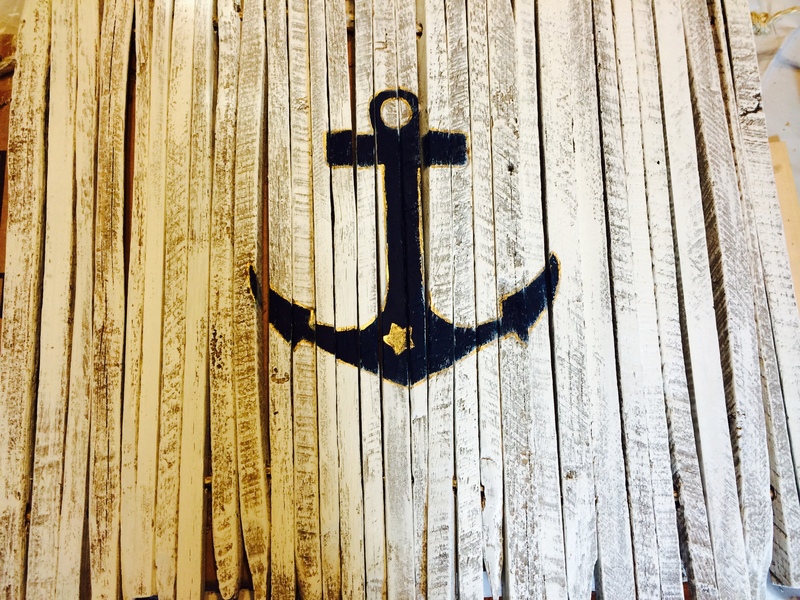 I have been busy making barn wood signs in all sorts of designs. 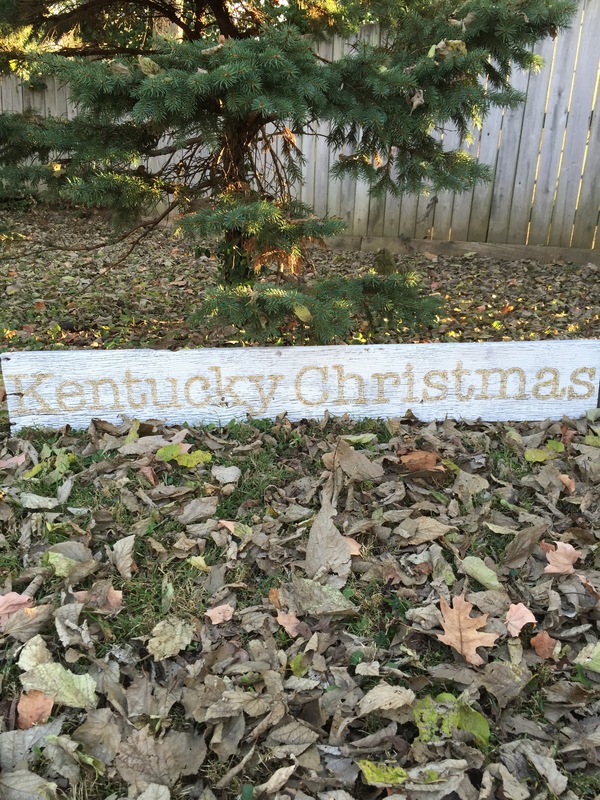 From german glass glitter to horseshoes, Barnwood & Bluegrass has something for everyone, on your list. We have a variety of sayings, sizes and colors. 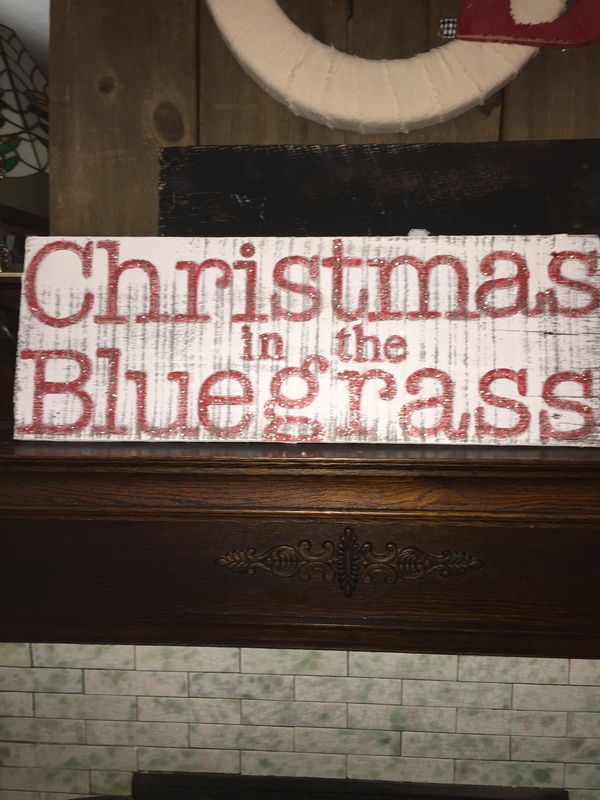 We’ve taken some classic Barnwood & Bluegrass designs and made them smaller, for those who don’t have a lot of wall space. There has been a great demand for these! 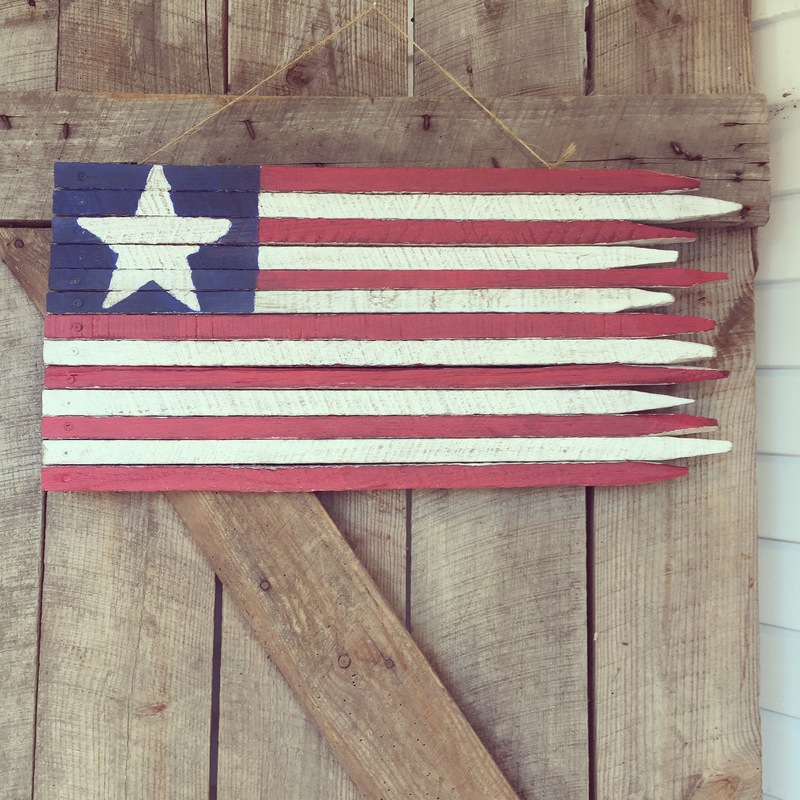 No matter your taste or design style Barnwood & Bluegrass is sure to have the perfect Reclaimed, Rustic Elegance you are looking for! 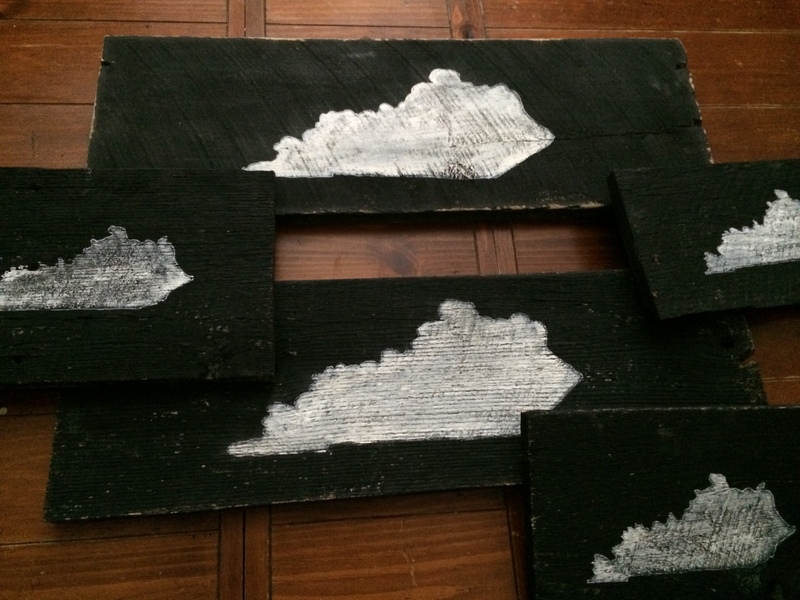 You will now be able to find Barnwood & Bluegrass in several shops around the Commonwealth…We are at The Urban Farmhouse Market, on Frankfort Ave., in Louisville, KY. We are coming soon to Jillian’s in the Richmond Center, in Richmond, KY and we are at The Glass Factory on Highway 54, in Owensboro, KY. We have been busy filling orders for all of our wonderful customers on Etsy and regular customers in Louisville, Richmond and Lexington. This weekend was one of our biggest weekends and we hope to keep the business going! 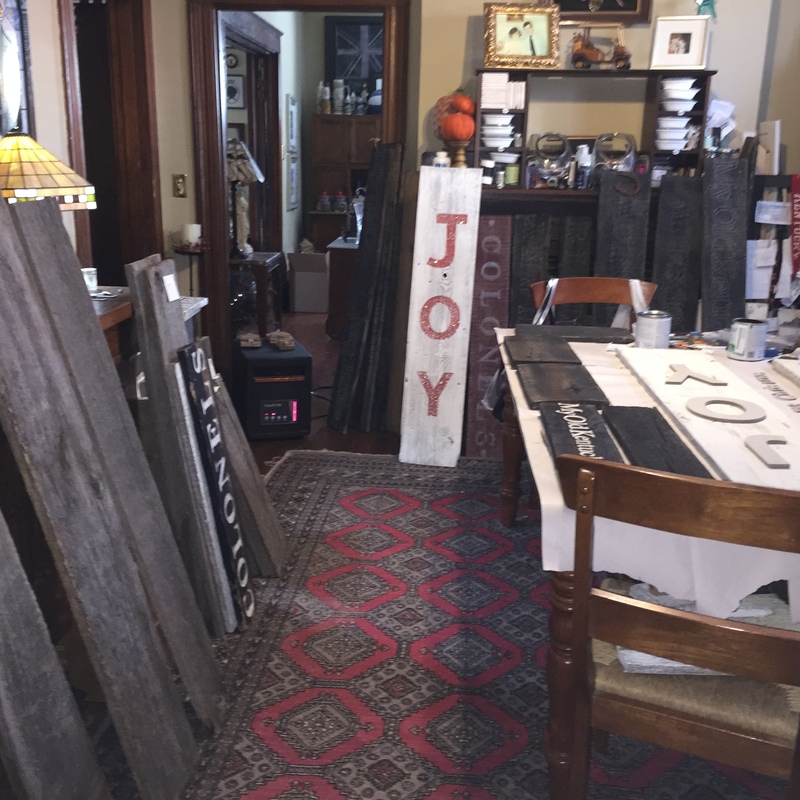 My little dining room is slowly being taken over by barnwood. Happy Veteran’s Day to all of those brave men and women who serve our country with dignity and grace. You are the real heroes! Be sure to check us out on Facebook, Instagram and Twitter! Why am I so random when writing blog posts? Every class tells you to be consistent. So, why do I have a hard time staying focused? I could use the excuse “I have been so busy”…or “I have 4 children and I can’t find the time” or “there is this new awesome show on HGTV that I haven’t been able to stop watching (Fixer Upper…LOVE IT!! )!” Ok, I wouldn’t let my children get away with any of those excuses, so I guess I better lead by example and get my act together. 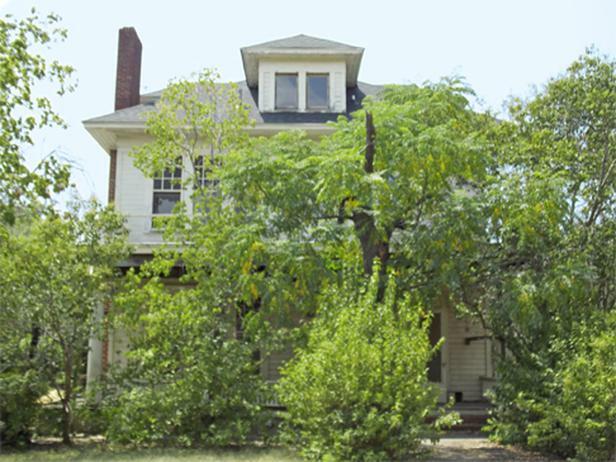 Doesn’t that make you want to go out and buy a Fixer Upper and Live Happily Ever After? Beautiful! I really haven’t been sitting around all day watching re-runs and eating bonbons, but I must admit that sounds wonderful! :). 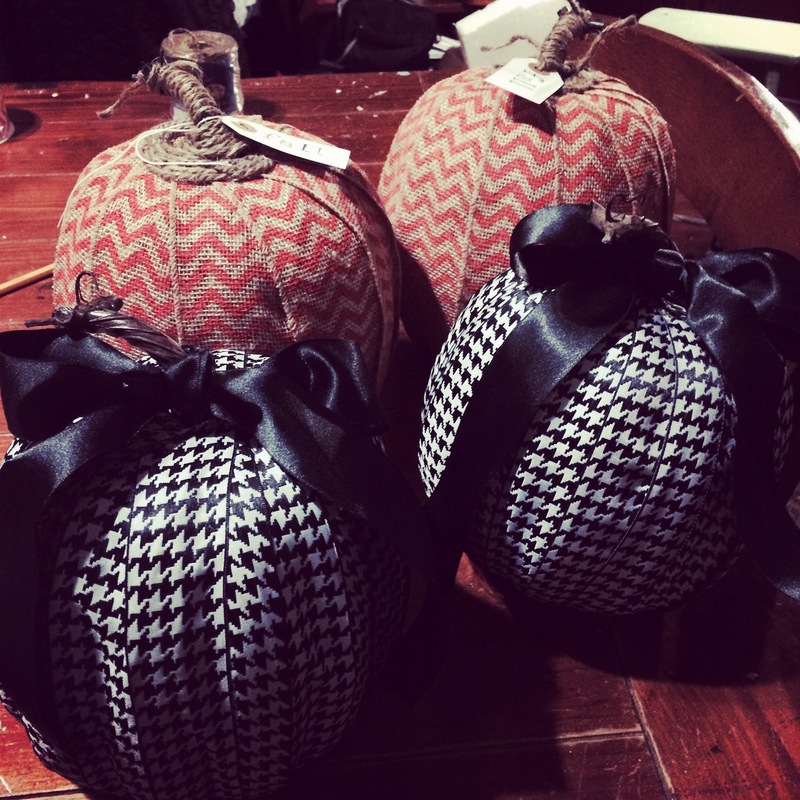 While I watch the show I am busy creating and painting…I had a big Fall season with my burlap pumpkins and houndstooth pumpkins. I SOLD out of every single one of them. It is so exciting to see my business grow each year. 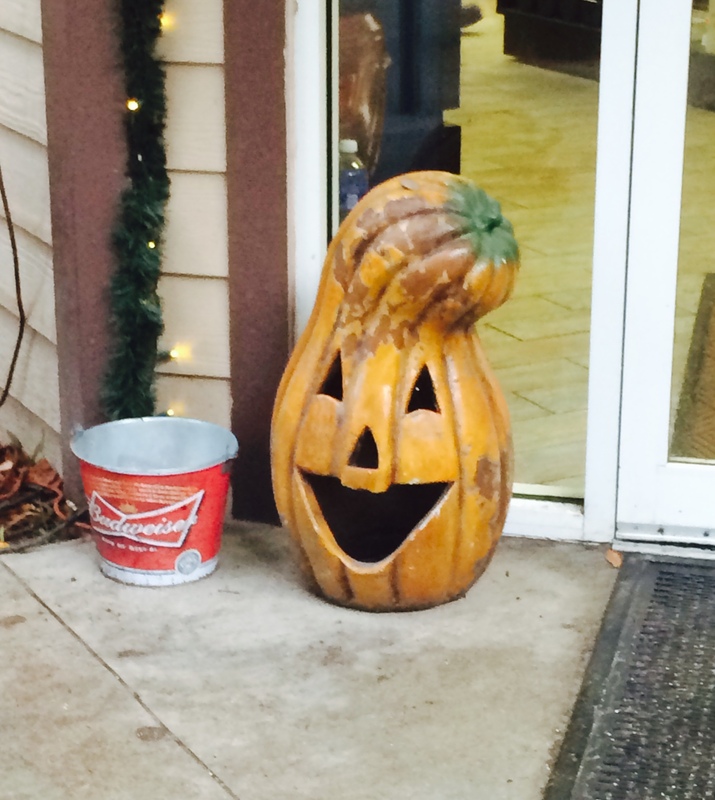 I had a wonderful review from a customer who bought 4 pumpkins, two of each… She had this to say… “These pumpkins are wonderful! I ordered two of each pumpkin and will definitely order more items from you! Your shop is beautiful, you have great stuff!” WOW! I was so thrilled to hear from this customer and appreciate her business. She could have bought pumpkins from anyone, but she chose me and my little shop and for that I am very grateful. 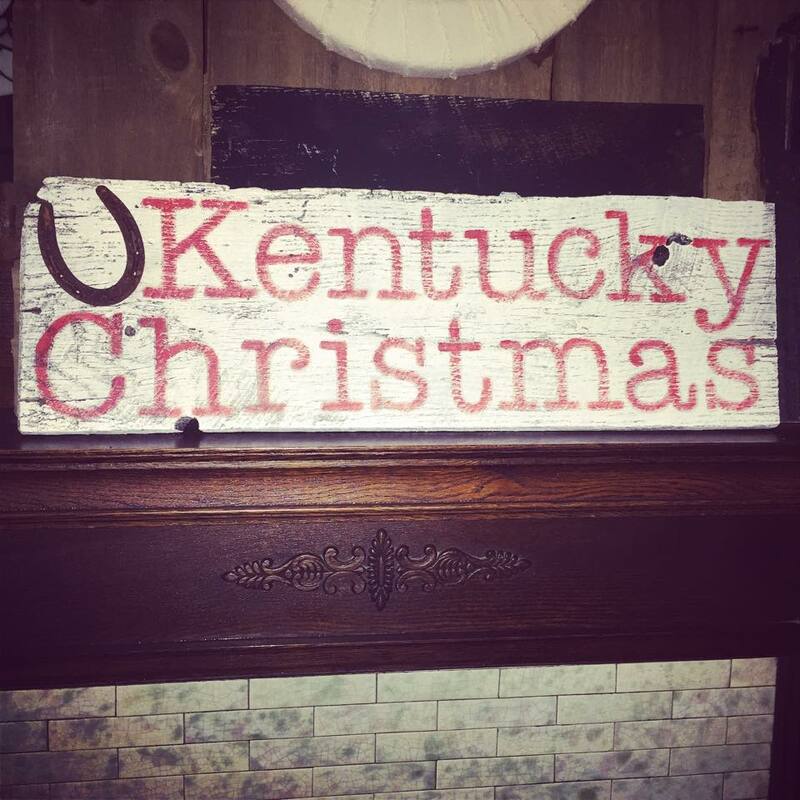 I am in the process of creating my Christmas items and put a sneak peak of a Kentucky Christmas sign, I created, on my Instagram and SOLD it within 5 minutes of the post. I hope that is an indication of a great Christmas Season! I hope you have a Happy Halloween! We had some interesting costumes leaving the house this morning…Batman, Leonardo the Teenage Mutant Ninja Turtle, Rick from Walking Dead and a Pac-man Ghost…Bet you couldn’t even guess which boys goes with which costume?? I hate that we were so rushed that I didn’t even get to snap a picture. Just more excuses! 🙂 Happy Halloween!! 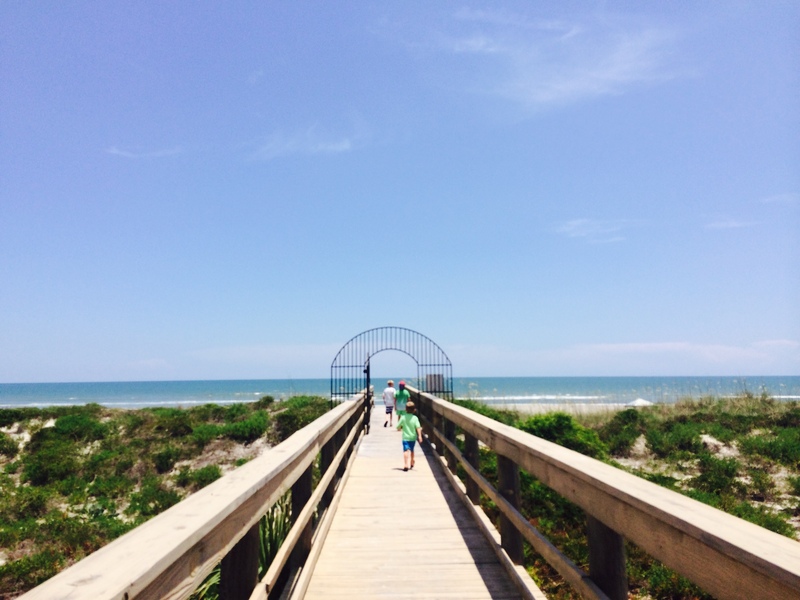 After being on vacation, for two weeks, it is hard to get…as they say…back in the saddle. Unfortunately, I was thrown full force, back into the saddle. The last two days of our vacation, one of my sons had a stomach bug. On the way home, several people had horrible headaches and when we arrived home, 2 more children came down with headaches, stomach aches, sore throats and the most dreadful part of it all…pink eye. 😦 Welcome back to reality!! Vacation, overall, was a little slice of heaven. 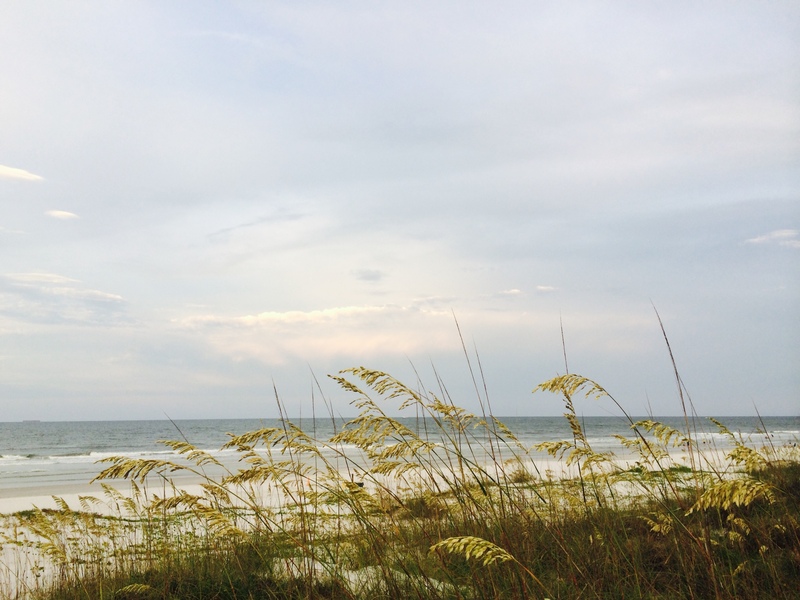 We relaxed on the beach, took walks on the beach, cooked great food, ate at great restaurants, visited UF, spent quality time with friends and family and browsed through some adorable shops. I was in hog heaven. 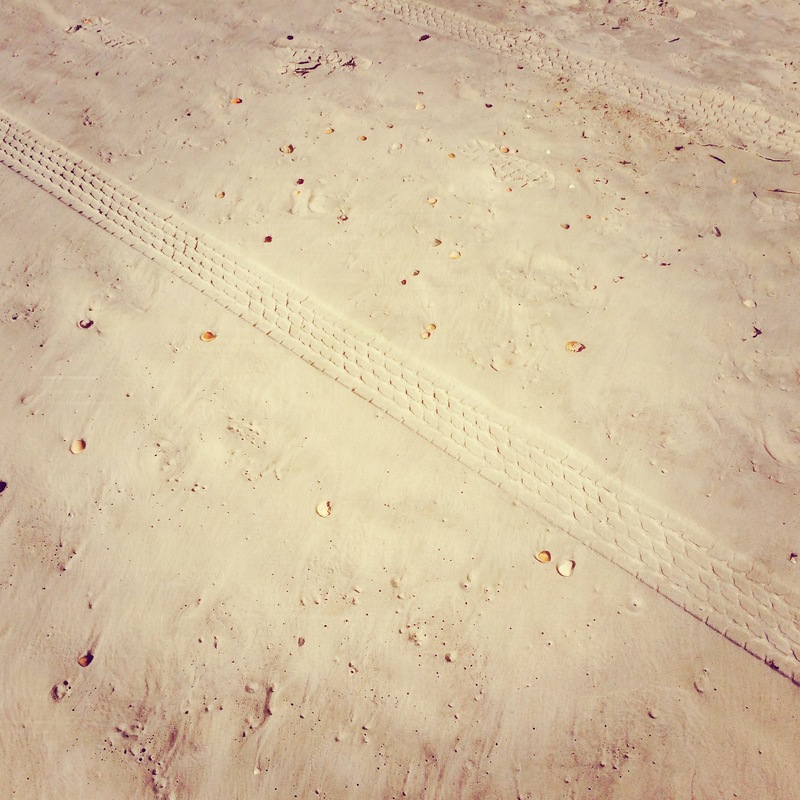 Walking on the beach is always my favorite time. 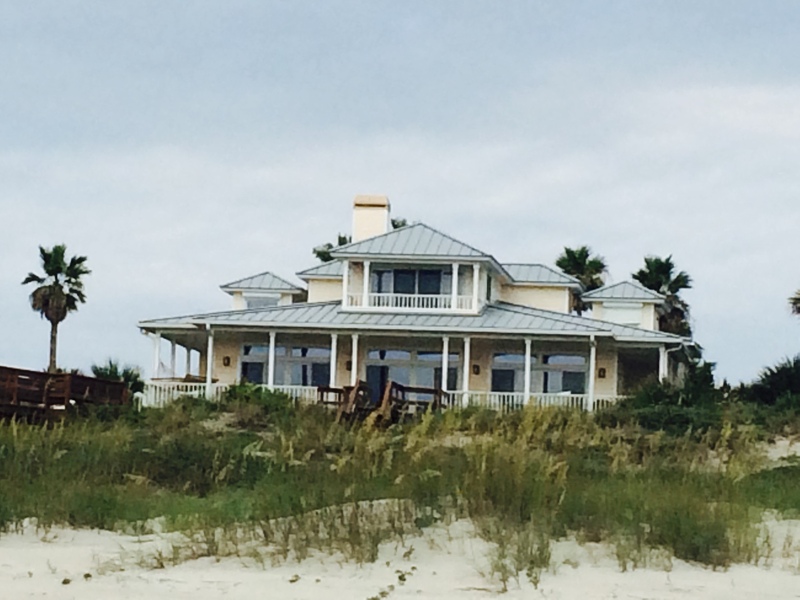 Looking at all of the beautiful beach houses.. 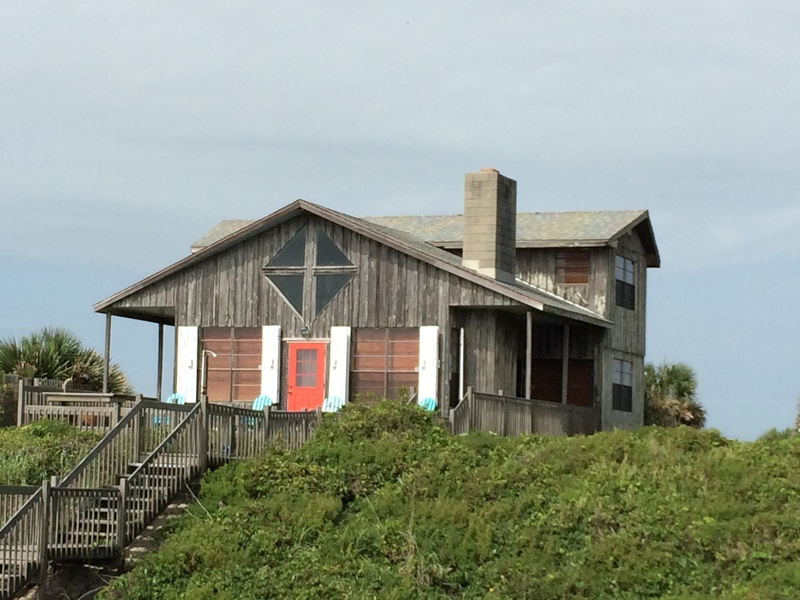 I think I found my dream home! 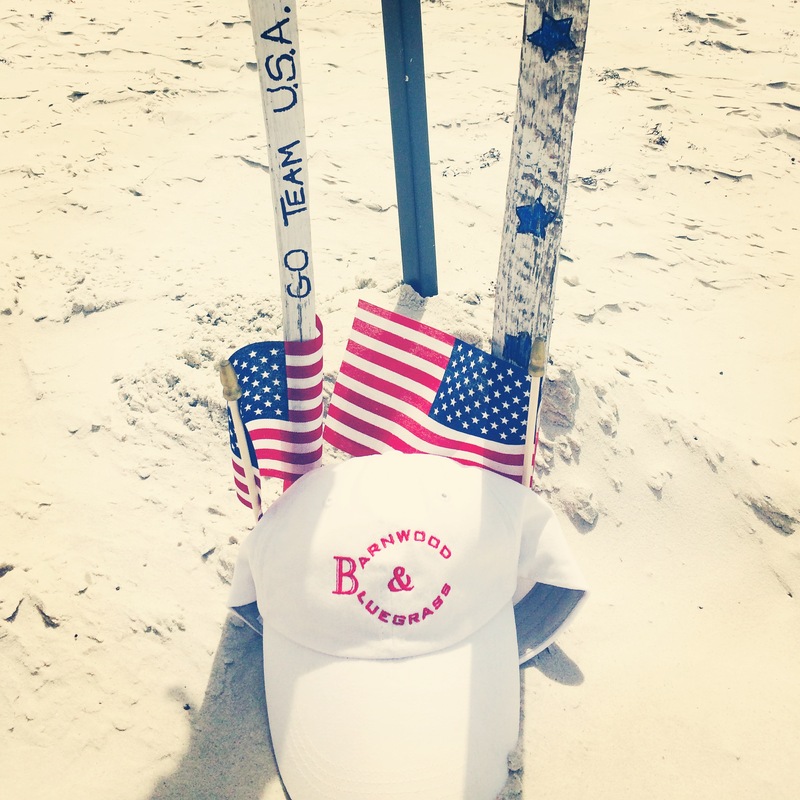 We were able to celebrate Independence Day, at the beach, watch the World Cup and the Wimbledon Finals. It seems like we crammed a lifetime into two weeks, but it was worth every minute. 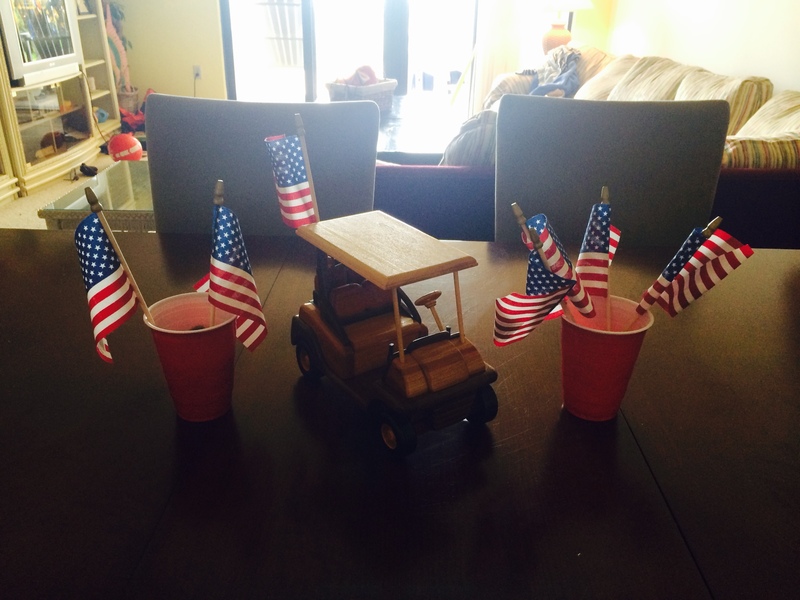 The cool golf cart was given to the boys, by MeeMee and BoBo. It is all hand carved. Beautiful! 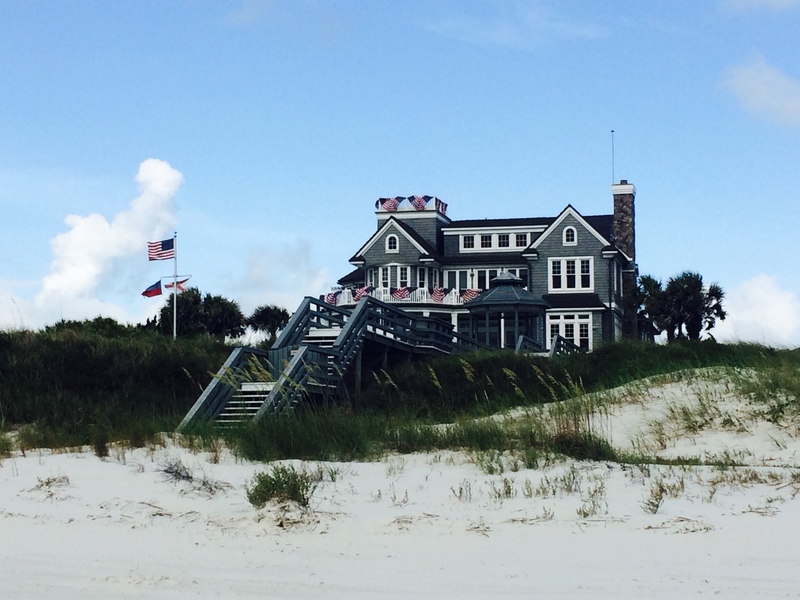 This vacation was certainly filled with some unexpected surprises! We had a blast and spending time together was priceless. I hope we have created memories for our children, that they will remember forever. I know I will. 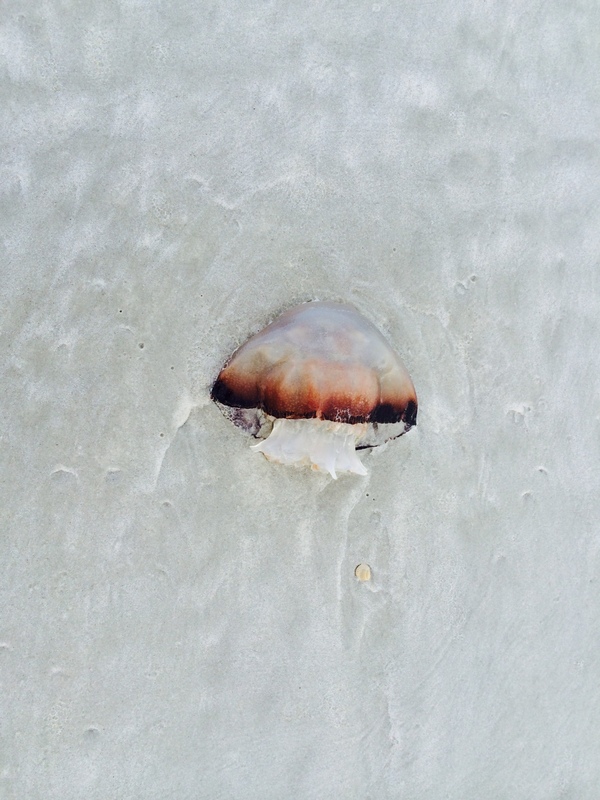 The jellyfish were really out this year! Ouch! 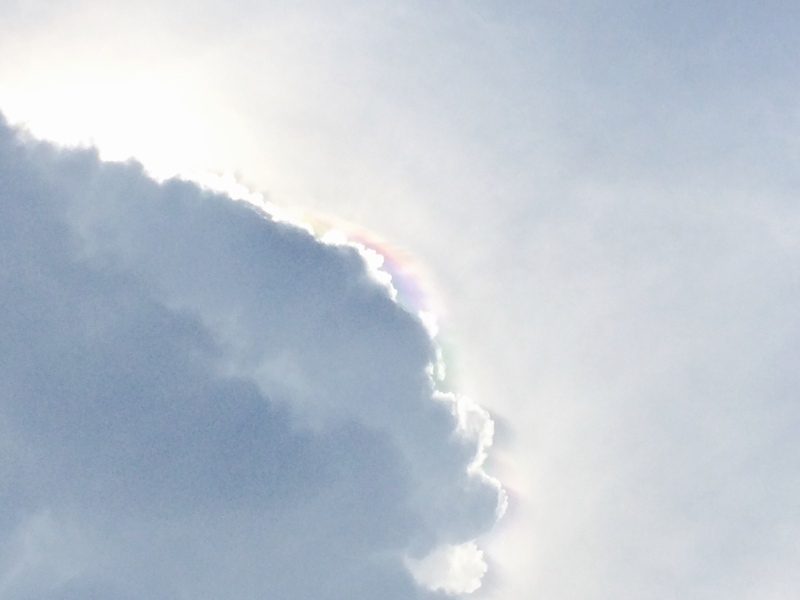 The rainbow, on the edge of the cloud, was an amazing sight. I loved sharing that moment, with my boys! 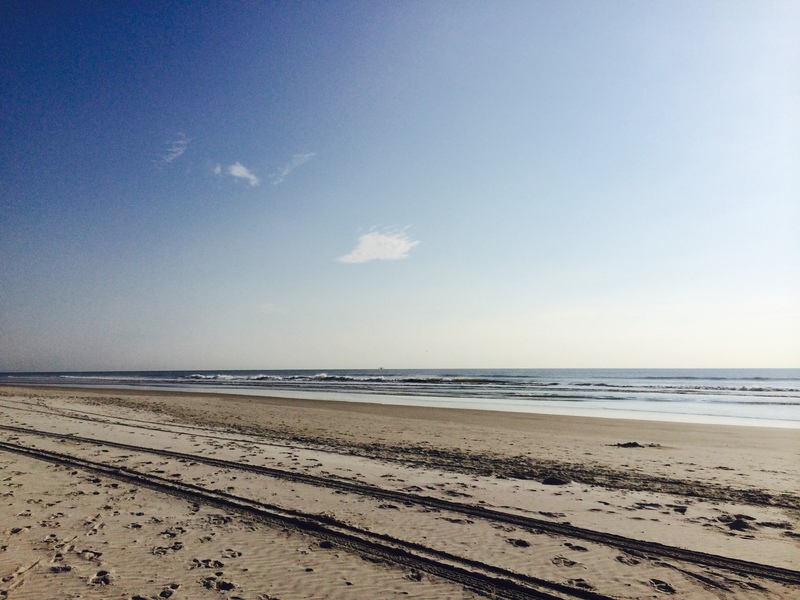 Crescent Beach is one of the most beautiful beaches in the world! I already can’t wait for next year. School will be starting soon, the leaves will be falling and my oldest son will be looking to college, in a couple of years. My youngest son is staring Kindergarten and I will have two in Middle School. These days are precious and I want to soak them all up. 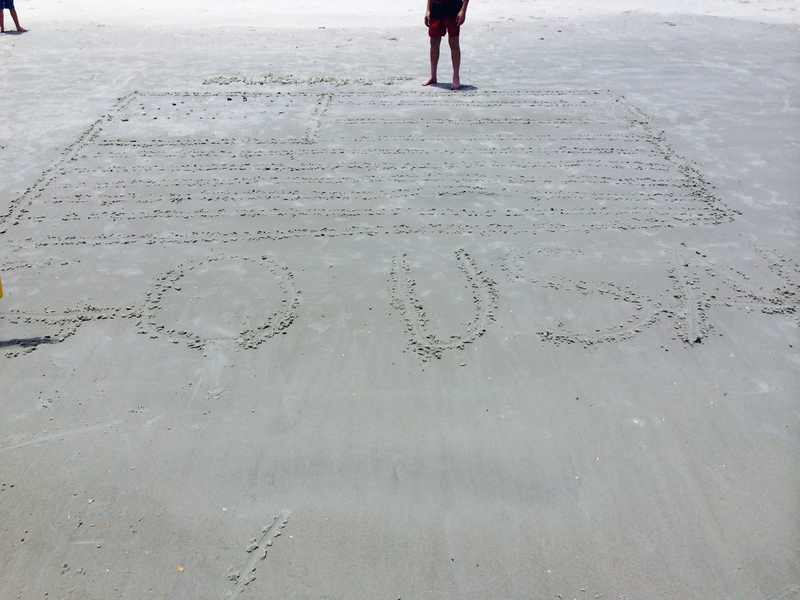 Until next time, St. Augustine! We love you and thanks for all of the great memories! 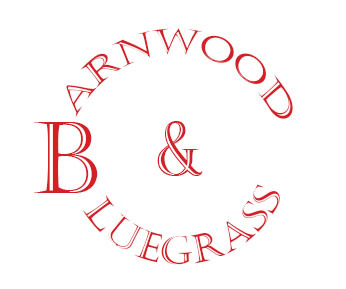 I have recently been challenged to come up with an elevator pitch for Barnwood & Bluegrass. For those of you who are wondering… an “elevator pitch” is a sales pitch about a person, business or product that can be summed up in the time it takes to ride in an elevator. You’ve seen them in movies…one of my favorite, elevator pitches, was Tess McGill (Melanie Griffith) in the Working Girl. After she made the pitch Oren Trask said “You’ve got a real fire in your belly, or was that just a one-time stunt?” Tess replies ” I’m not quite sure what you mean, sir. I’ve got something in my belly, but I think its just nervous knots” Nervous knots, that’s what I have! The challenge comes from Martha Stewart American Made and states I have to sum up my business in 145 characters or less. She is conducting a search for American Made Entrepreneurs. The grand prize is $10,000 towards your business, a trip to New York to appear on her radio show and a spot in Martha Stewart Living Magazine. Now, if anyone knows me, I can’t sum up the last hour in 145 characters or less. I am a story teller, I love to talk and go on and on especially when it is about my family or my business…See what I mean? 145 characters is a major challenge. Now, I don’t have any delusions of grandeur about winning the contest, I just thought it was a good way to challenge myself and maybe get my name out there. There are hundreds of really talented entrepreneurs applying for this one spot who have a much larger budget than me and my grassroots business. There are other questions that allow you to use 1000 characters. I really liked those questions! Feel free to leave me a comment…what do you think? Should I have nervous knots? 🙂 If you are an “American Made” Entrepreneur I have included the link to the contest below. Has it been while, since I’ve been on the blog? I have been so busy trying to get in as many orders in as I can, before we leave for the annual family vacation, that I haven’t had a single chance to write a blog! I love blogging! I love writing… I have since I was a little girl. 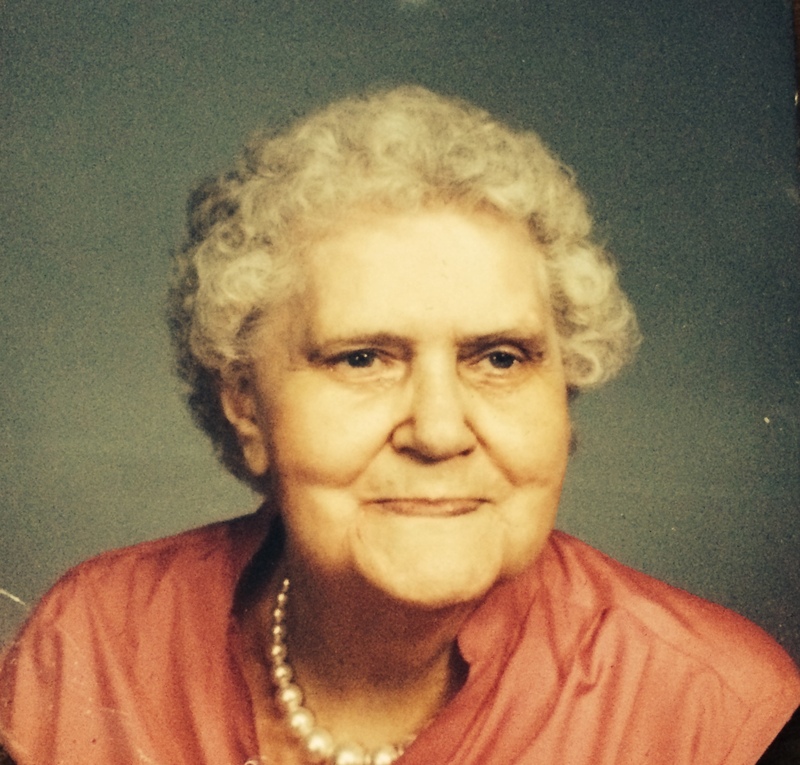 My mother always encouraged wringing, art, dance…creativity in any form. I think she would be so excited to know that you can paint and write and do just about anything, these days, via the internet. Thirty years ago, before she died, the only way to peddle your items was to go from shop to shop and consign your items. 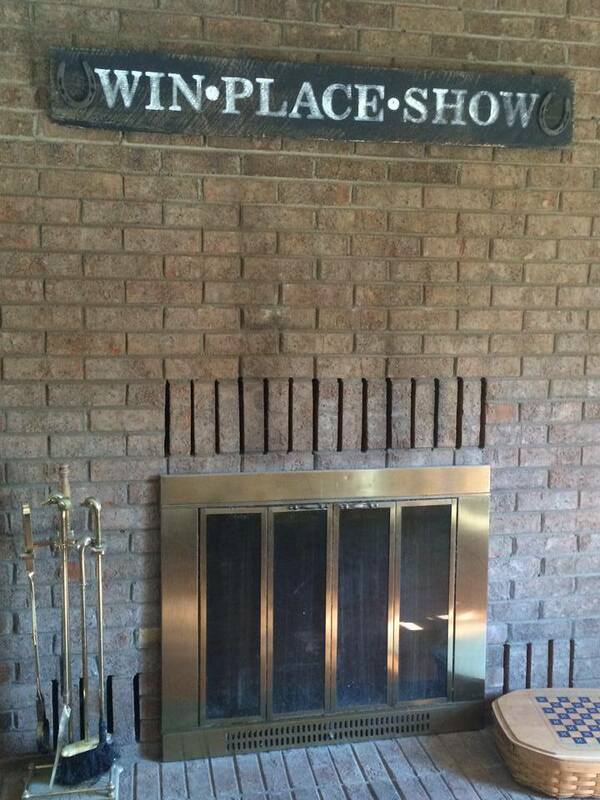 That’s exactly what she and her friend would do with their checker boards and backgammon boards. They were beautiful! I remember her coming home, so excited to have consigned 10 checkerboards to the local boutique. I have had that same feeling when I wholesale my items to a new shop, I get a new order on Etsy or a local friend orders something from me. I know every time I sell something she is right there sharing in the excitement. 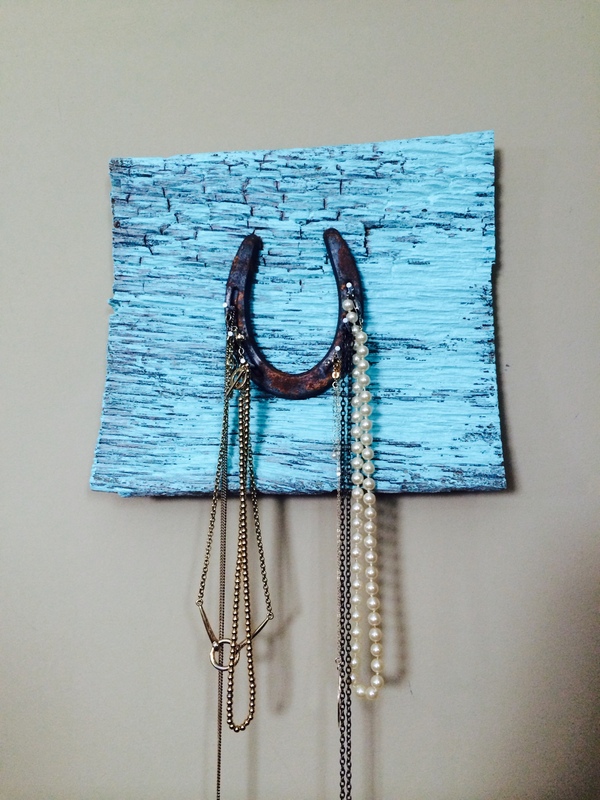 I absolutely love creating new items. 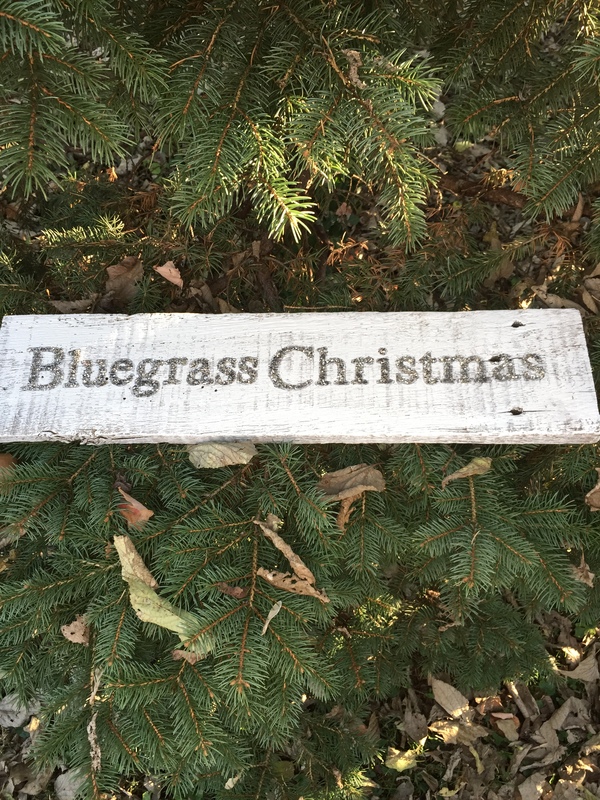 While I have been in the process of fulfilling orders, I have been trying to come up with….yes, I can’t believe I am going to say it…Christmas items. 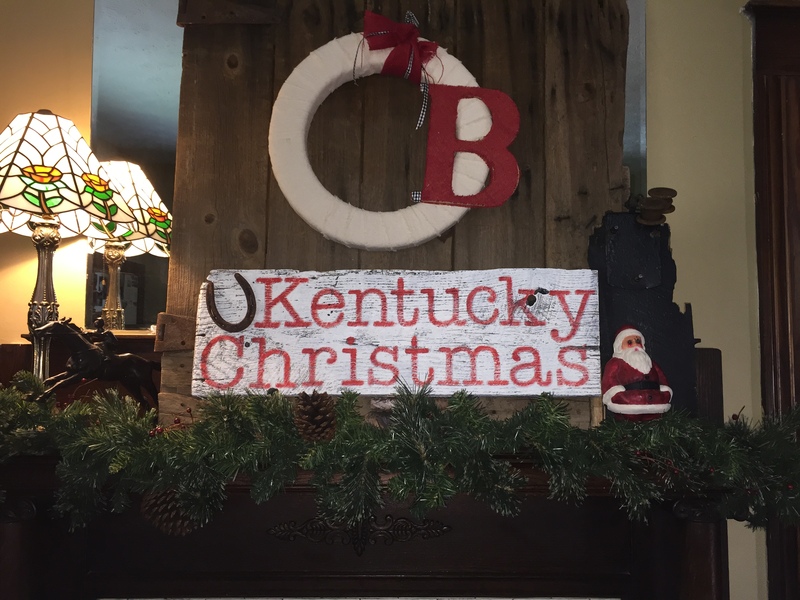 Christmas…In June? When you are in the retail business, the “Christmas”season comes earlier and earlier every year. I believe I was at Hobby Lobby the other day and they already had Christmas items, on the shelves. Crazy? Yep! 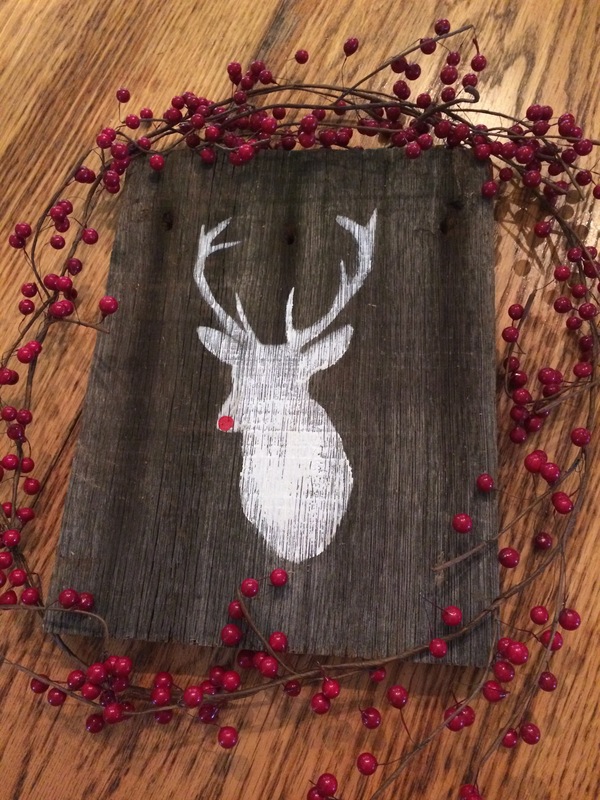 I was so proud of myself when I was able to make this little Rudolph sign. It reminds me of the Christmas reindeers my dad use to make for my mother. They were awesome. They had a log for a body and tree limbs for legs and antlers. My grandmother knitted hats and scarves for them. So cute!! 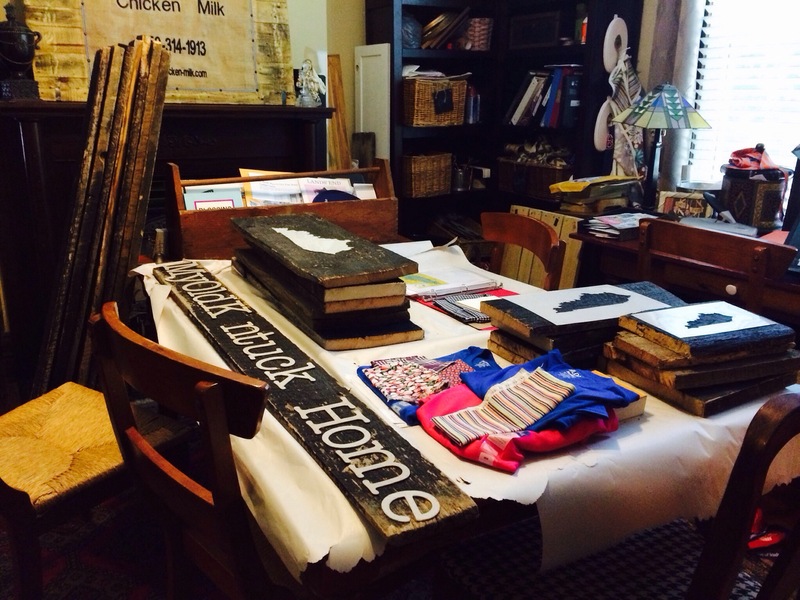 My mother always included her family in her business and I love to do the same. 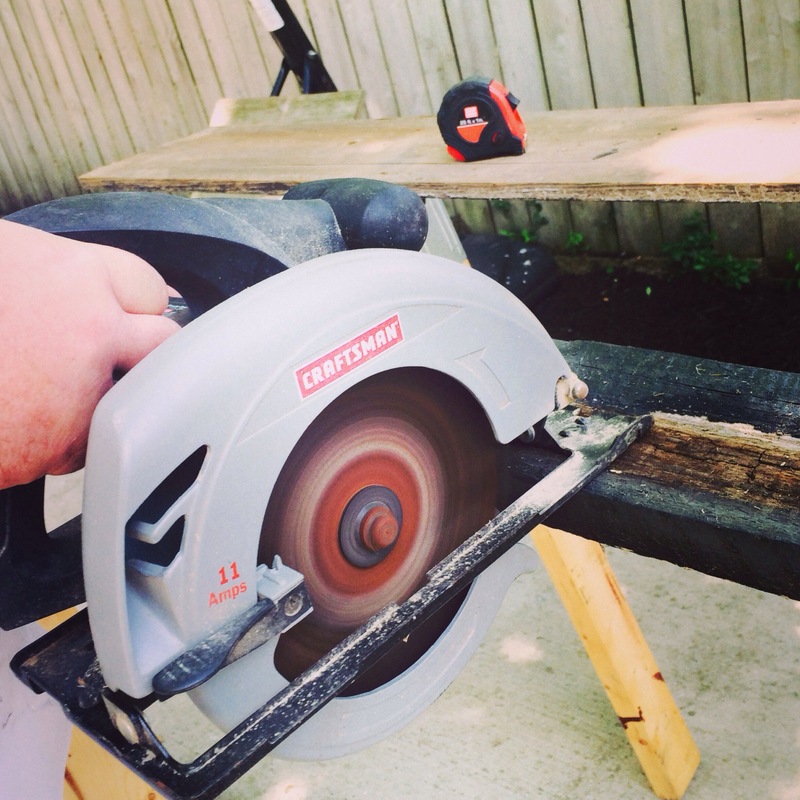 My husband is always helping me cut barn wood, tobacco sticks and any other thing I ask him to do. He is so supportive and I so appreciate him and my children. I hope you enjoy my creations as much as I enjoy making them. 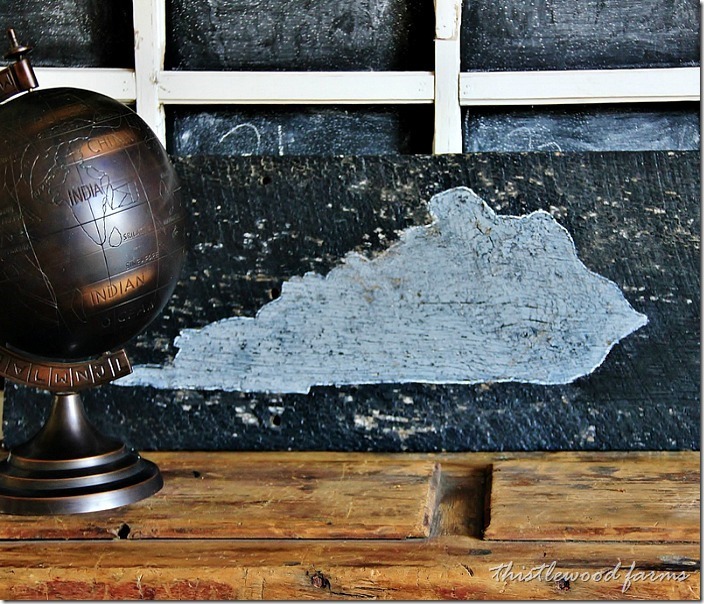 Barnwood and Bluegrass is Reclaimed, Rustic Elegance. 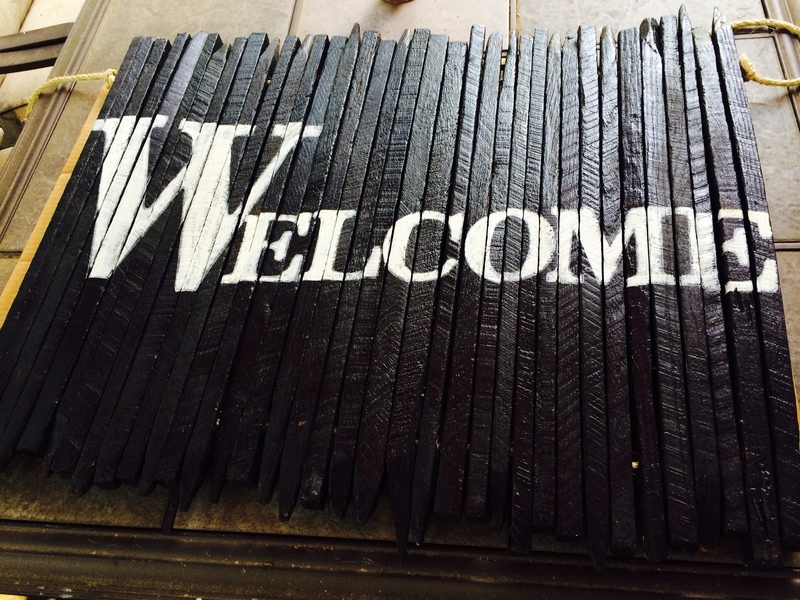 My tobacco stick door mats have been a BIG seller, recently. 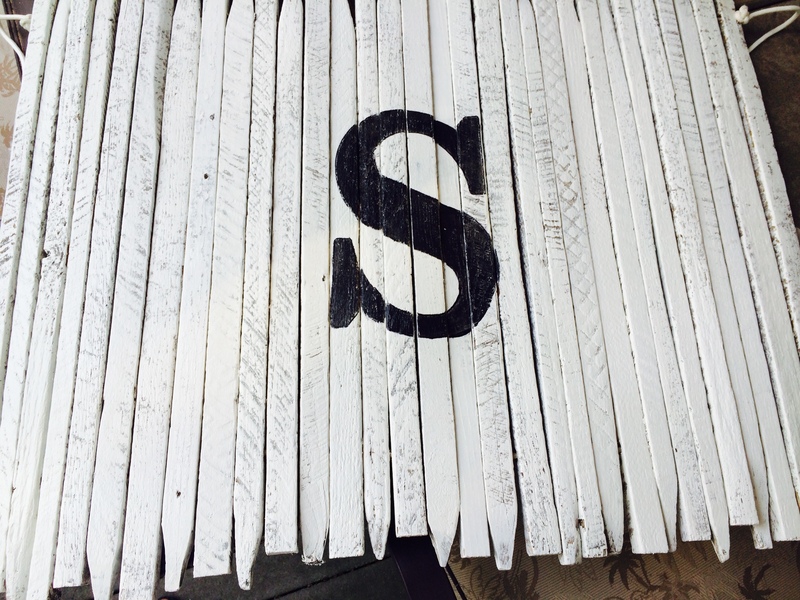 They are very sturdy and are one-of-a-kind. You can check them out at…. Thanks for visiting. You’re a peach. I’m finally back on the blog. After changing my name, I had a few glitches getting everything to “sync”. So, now that I have all of the technical “stuff” taken care of, I can share another treasure that my wonderful neighbor was throwing away. After the awesome adirondack chairs, I knew not to wait. So, as we turned the corner of their back yard I saw this beautiful cabinet sitting on their back porch. He said “are you interested?” I said “how much?” he said “just take it off my hands” I offered him $20. He took it, at first and as the boys and I came back to get the rest of the drawers he gave it back to us and said ” I just really needed someone to take care of it and take it off my hands. Your money is no good here.” Neighbors like that are one in a million and we are so lucky to have them. 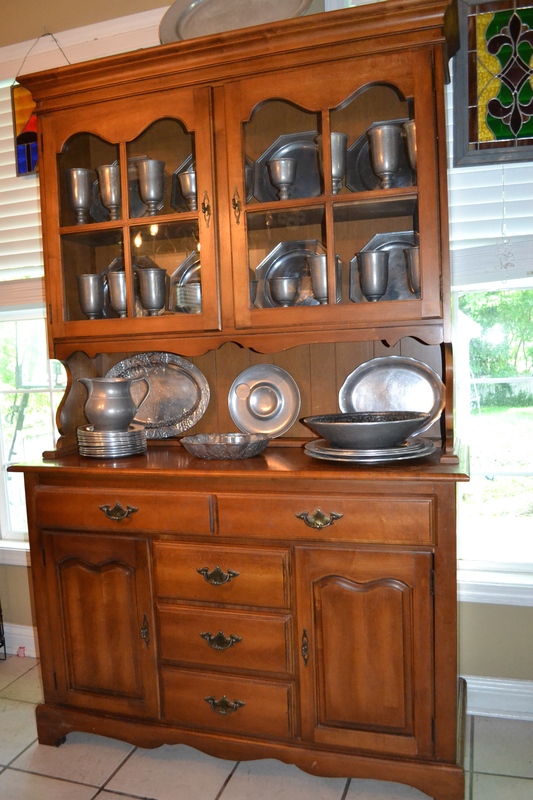 I have been wanting a cabinet, to hold my collection of pewter. They are all family pieces and I have been wanting to give them the proper display. You can imagine the excitement when this little piece rolled around. 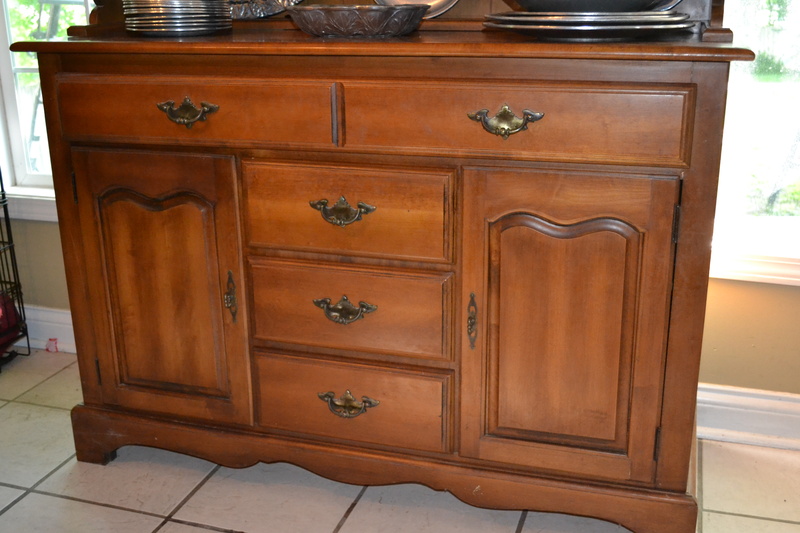 I had been looking at similar pieces in the Peddler’s Mall and antique stores. The prices ranged from $250.00-$400.00. So, when I was able to snag this piece for F-R-E-E, I was blown away! 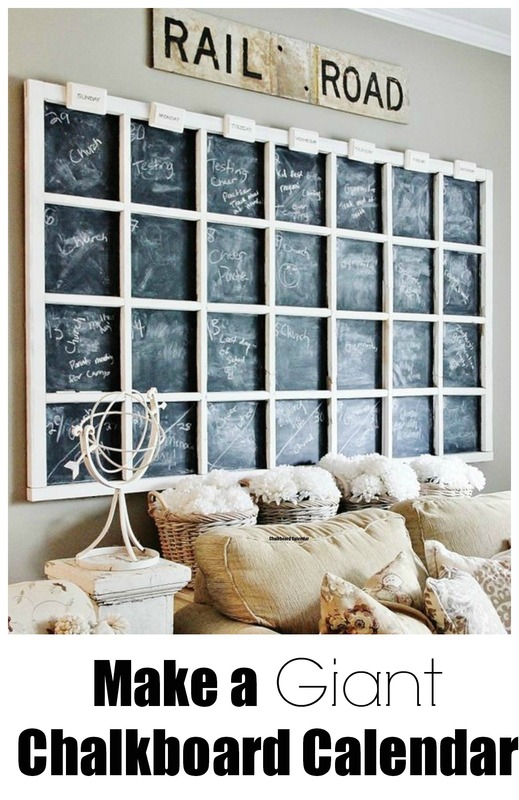 I absolutely love it and considered painting it with milk paint, but I think it is beautiful just the way it is. Some pieces deserve to be in their original glory and this piece is no exception. I am a lucky girl who has been blessed many times over and I am amazed when another blessing, no matter how small comes around. I have enjoyed every second of this cabinet. 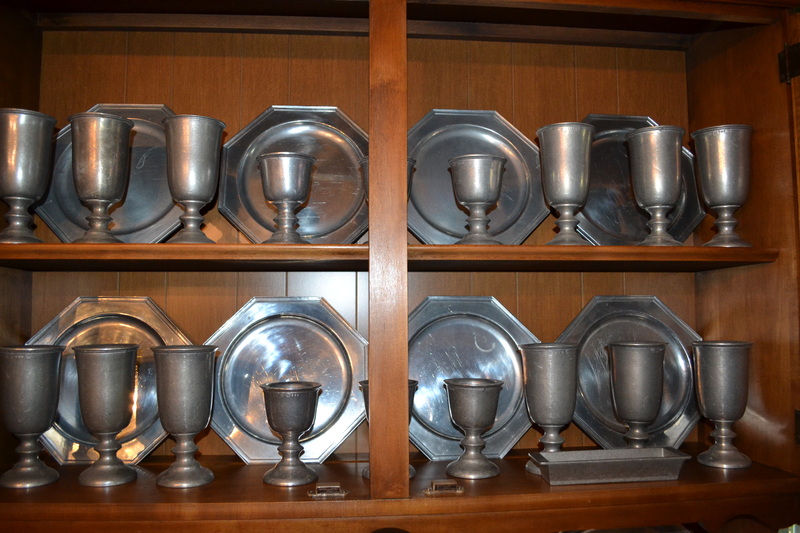 When I look at it and see those beautiful pewter pieces, they take me back to happy times with my mom, dad, brother, family and friends. 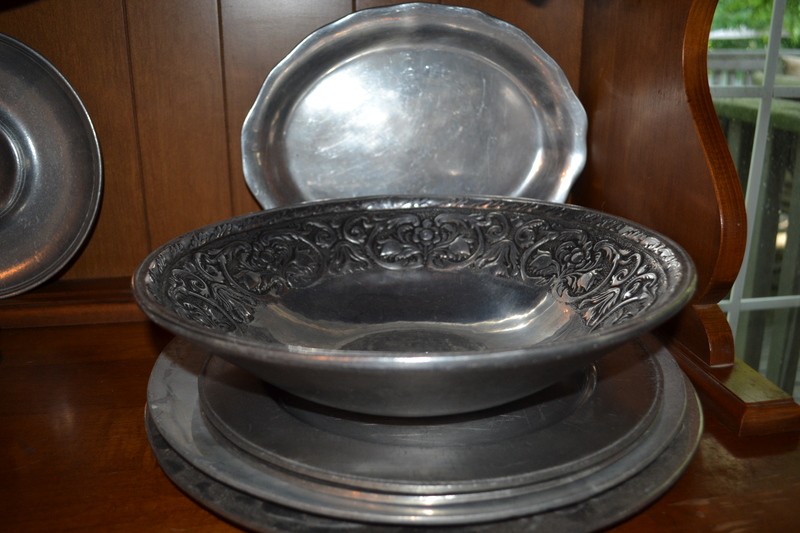 Thanksgiving’s, Christmas’, Easter’s all of the really good times we had good meals served on those plates and out of those bowls. I hope someday, when my children receive those plates, they have some similar memories. 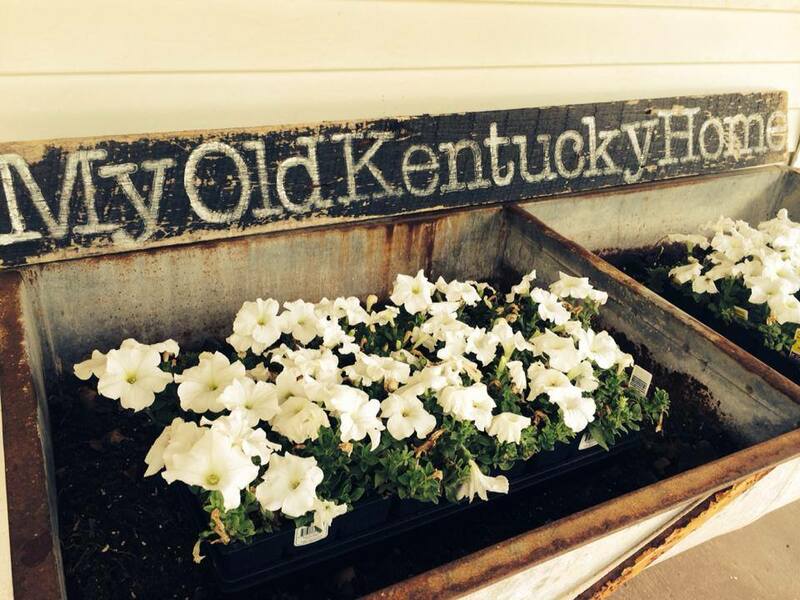 Here’s to good memories and good neighbors! I visited Cincinnati, this week and have some pictures to share for next time. Enjoy your day! You’re a Peach! Wow! It has been a crazy few months. My business went from a few orders here and there to now growing at a pace that I feel Chicken Milk needs to take the next step. 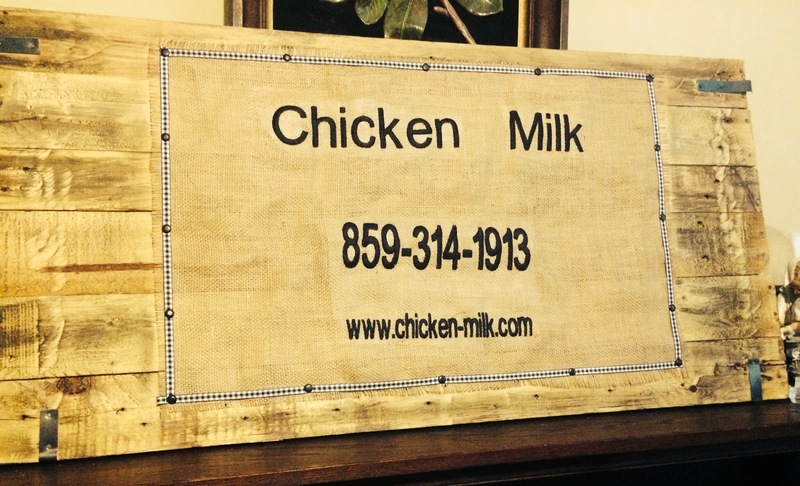 Chicken Milk began a few years ago when a friend and I decided to start a little business to help our families make a little extra money in a very hard and struggling economy. Since then, my business partner had two more children and decided that she wanted to focus her time and energy on her family. I can’t say enough wonderful things about my ex-business partner. First of all, I hate to call her “ex” anything. She is still a very good friend and very supportive of my business. While the name Chicken Milk is very cute and I will always remember the good times with Chicken Milk I have decided to re-name and re-brand my products. 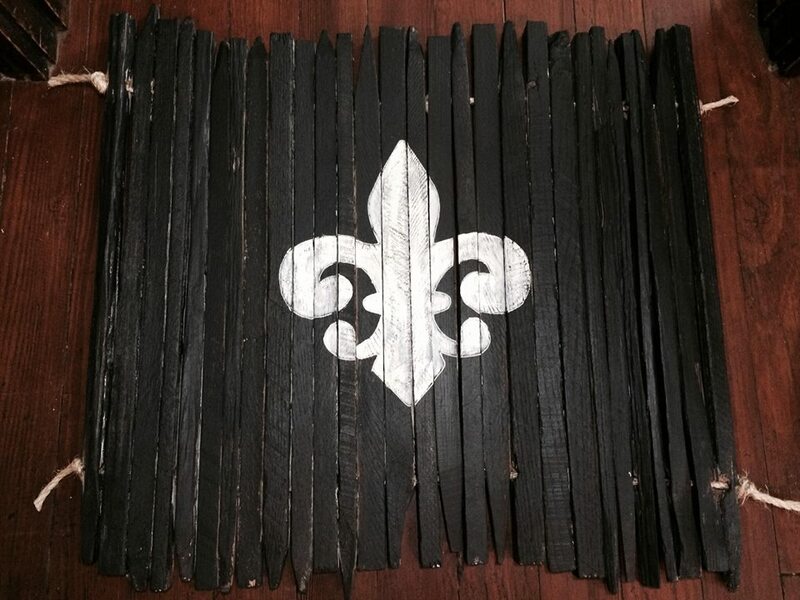 I will still carry Chicken Milk “Bug Juice” and still peddle my barn wood signs, tobacco stick door mats and all of the new and exciting things I love to create. I am just going to be doing it under a new name. So many people ask “What is Chicken Milk?” So, to be more specific and to show my pride in my roots, I have decided to re-name the company Barnwood & Bluegrass. Here is a first look at my new logo. I am so proud of my business and I pray that God continues to bless me and my business on this crazy, learn-something-new-every day adventure! 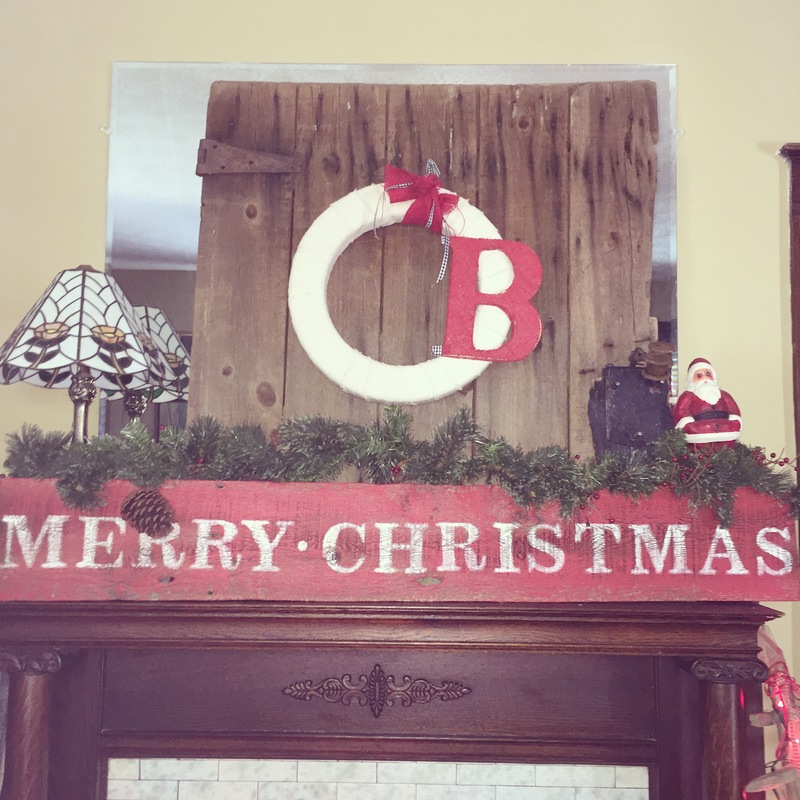 We decided to keep an emphasis on the “B” for our family name and of course Barnwood is my favorite reclaimed wood. 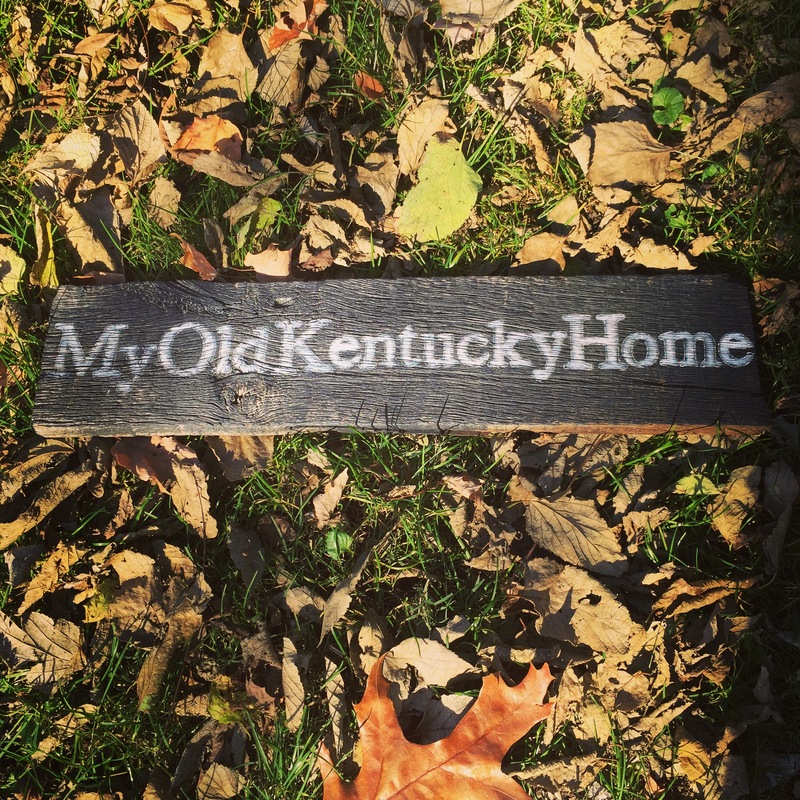 We chose Bluegrass because everything we make and everything that we are, is right here in the Bluegrass State! This weekend my husband, children and I worked on hauling, cutting and prepping some barn wood for a large order going out to a couple of clients. My husband cut the barn wood. My children hauled the barn wood. 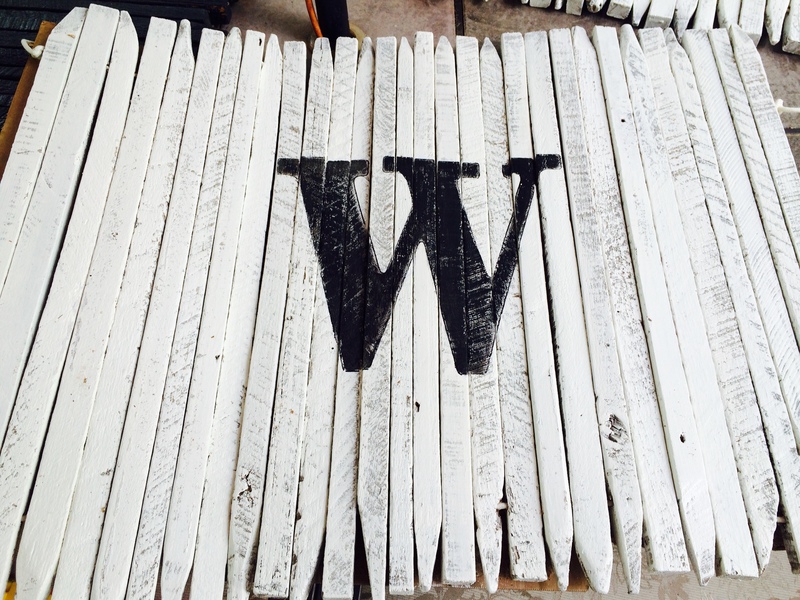 My children helped to prep the wood and I am now going to get busy painting. 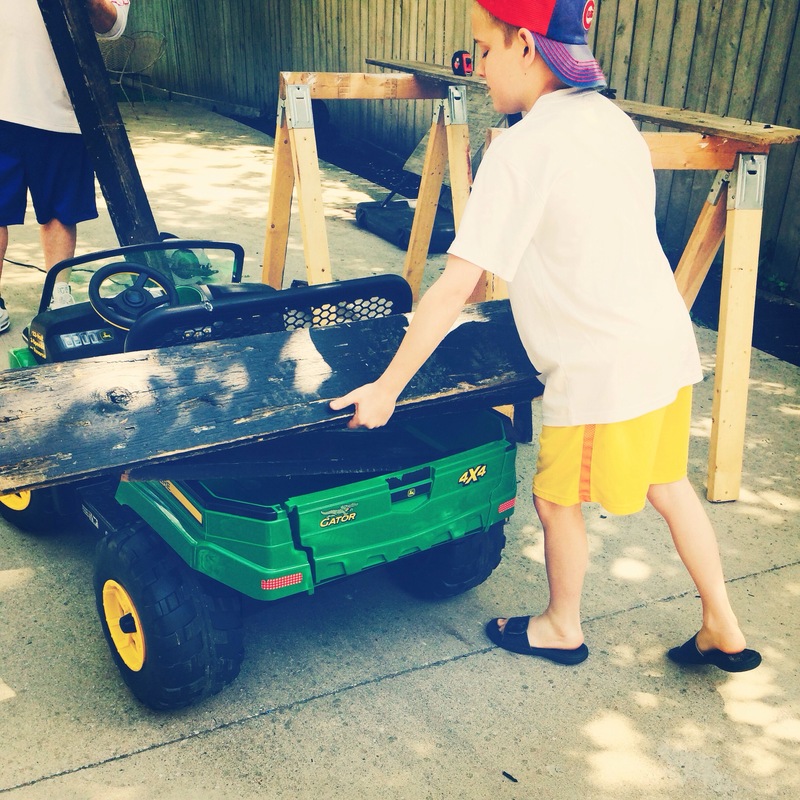 My oldest son has been a great help with hauling the wood, my second oldest has been awesome on the computer and social media, my third son is great at spreading the word to teachers and friends parents and my youngest has come up with many rhyming jingles for commercials. 🙂 They are excited and involved and care about what happens! I am so grateful for this time together and appreciate all of them so much! I have another passion in life besides, design and crafting…It is fashion. In my opinion, make-up and skincare fall in the lines of fashion because it helps to make you look good and to feel good. The line between fashion and design is so thin anyway. We use quality paint to make a piece of furniture look fresh and new just like we search for the perfect beauty products to do the same with our skin. The Vitamin C part is important. There has been all kinds of research on Vitamin C and the effects it has on elasticity, in the skin. I am not a doctor, so I cannot tell you exactly what the benefits are, but I am a consumer and I can tell you, for me, this has changed the entire look of my skin. 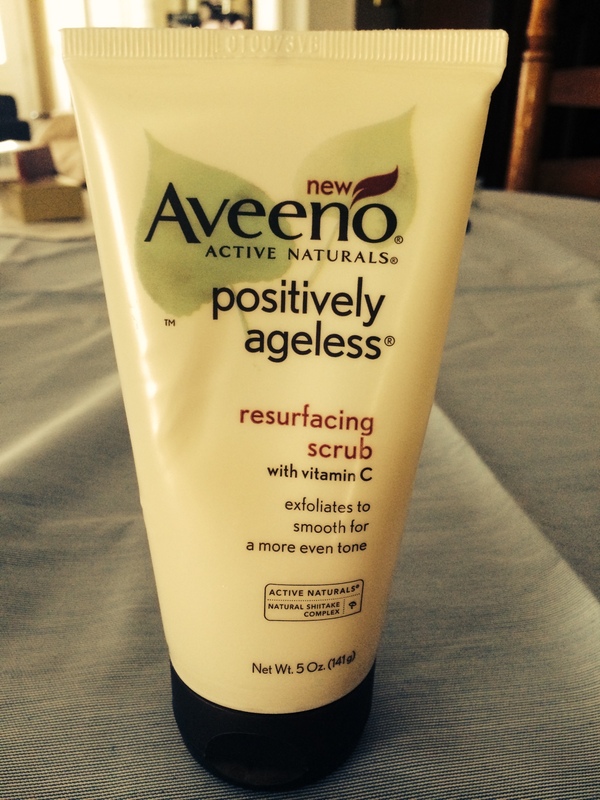 It is brighter, my fine lines are softened and my skin feels firmer. 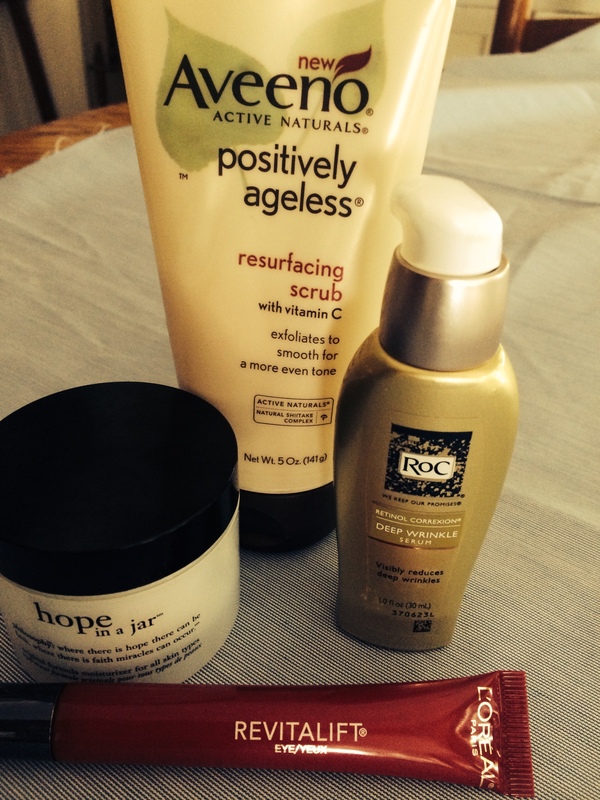 Along with this change in exfoliating my skin, I have tried a new moisturizing and wrinkle system. Now, by no means are all of these “cheap” and when you buy them all together, it can add up, but compared to what I was spending, these are actually very inexpensive and very high quality. The best thing about all of these products is that there are coupons for almost every one of them in your Sunday paper, nearly every week and you can find them in any drug store or major retail chain such as WalMart or Target. 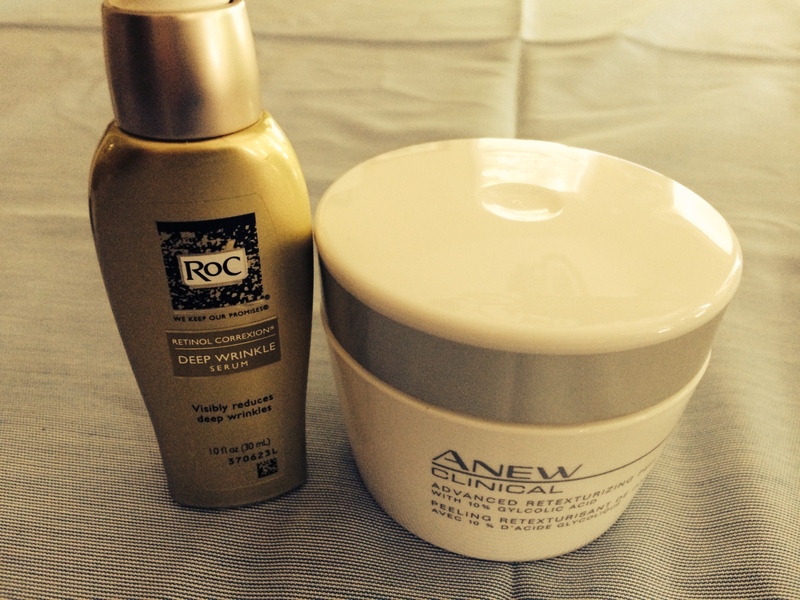 Never use these two products together…. The ingredients in each product (Retinol + Glycolic Acid = 0 results) will cancel each other out and you will not get any results. 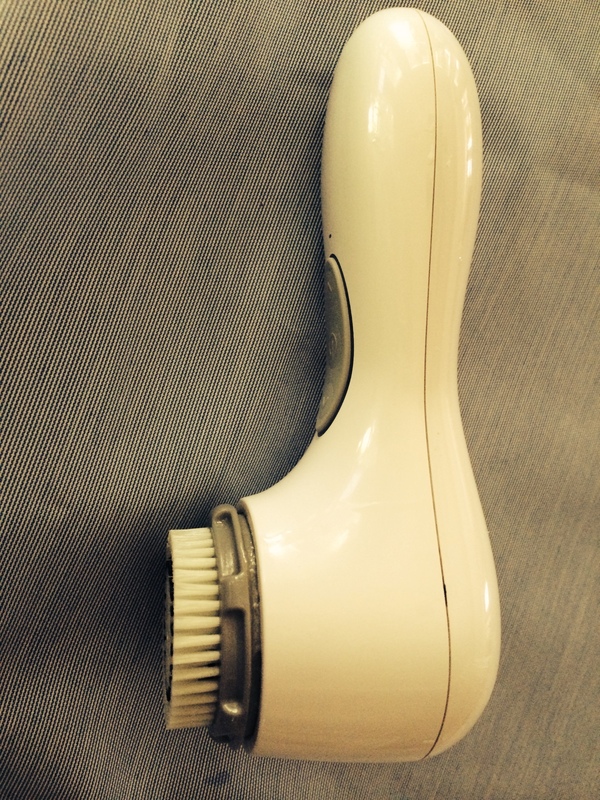 Now along with the facial scrub I use a Clarisonic Aria. If you are going to invest in an expensive product for your face, it should be one of these little gems. I was lucky enough to receive one as a Christmas gift. It not only cleanses the skin but it also opens up your pores to assist in absorbing the products you are putting on your face. 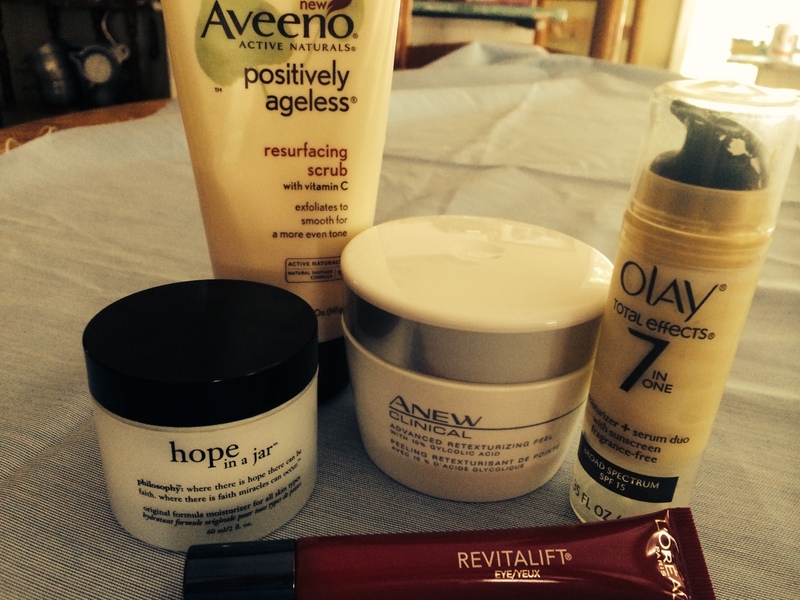 I have linked all of the products so you can check them out your self. Recently I made a silhouette for someone that I admire. Her name is Karianne and she is the blogger of Thistlewood Farm. I am sure you have heard of her, but if you haven’t you should really check out her blog. She is amazing and has such a beautiful brand. 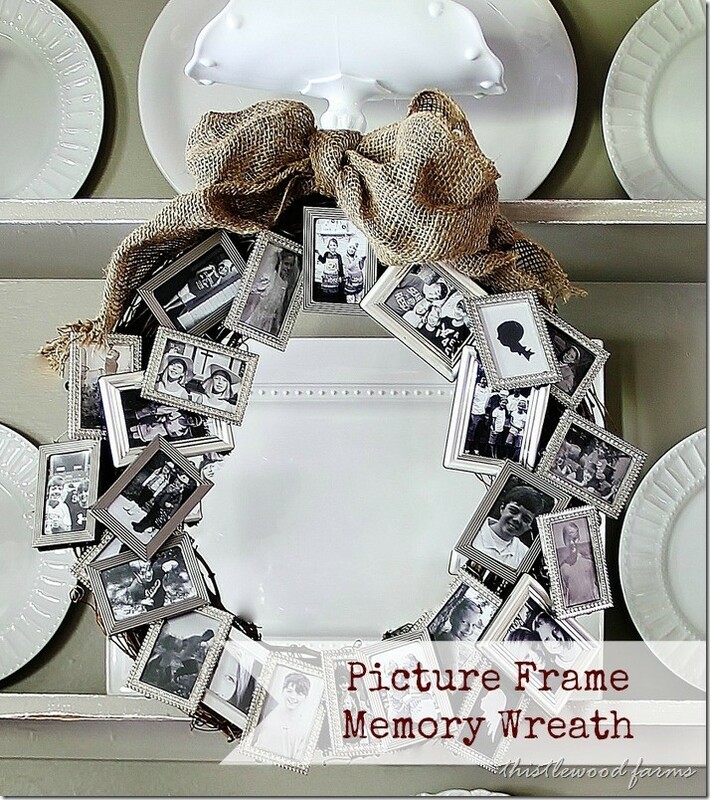 She shows you how to make beautiful projects…two of my favorites are the memory wreath and her chalkboard calendar. I’m sure you have seen images of both floating around on Pinterest. She featured the silhouette in her April 10th edition of “Thistlewood Farm” and it is titled The Week That Was. I recently contacted Karianne to make sure she was still enjoying the piece and she sent me the sweetest email in return…here is what she said…. I felt like I had gotten an email from …well, from Karianne! I admire her so much and these words really made me feel so good. I owe a great big Thank You to Karianne. Since she mentioned me in her blog and linked back to my Etsy store I have SOLD a lot of silhouettes and it has been one of my most popular items to be viewed and favorited on Etsy. She truly has been an inspiration to me and I hope that someday I can be that for someone else. You’re a Peach!